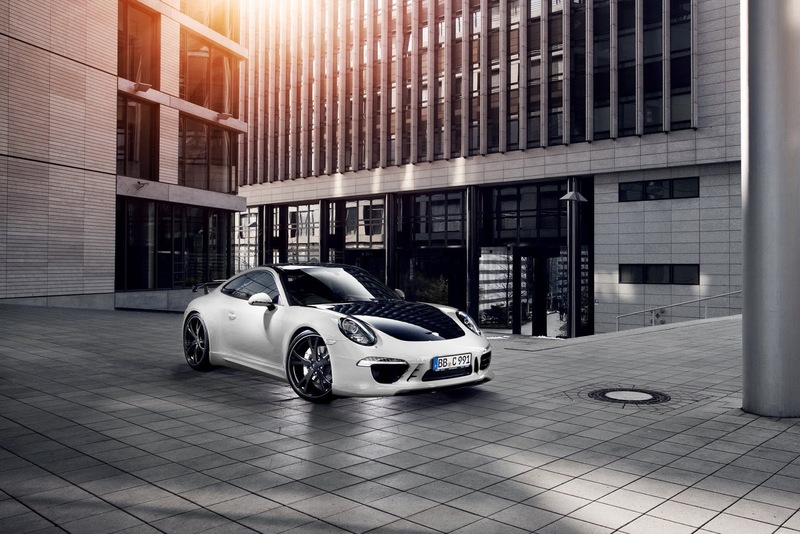 TECHART Automobildesign presents its individualization program for Porsche 911 Carrera 4 models. The valve-controlled TECHART Exhaust System Racing with central outflow, the TECHART Noselift System, carbon fibre interior styling packages in new attractive colours and illuminated TECHART door entry guards complete the TECHART Aerodynamic Kit. On new 21-inch TECHART Formula IV light-alloy wheels in 5-twin-spoke design and bi-color finish TECHART introduces its interpretation of the 400 hp Porsche 911 Carrera 4S Coupé from September 12 to 22. 2013 at 65th Frankfurt International Motor Show. The TECHART individualization program for the Porsche 911 Carrera 4 models demands technical and functional quality, as well as a stylistic treatment of the original vehicle’s characteristics and shaping. 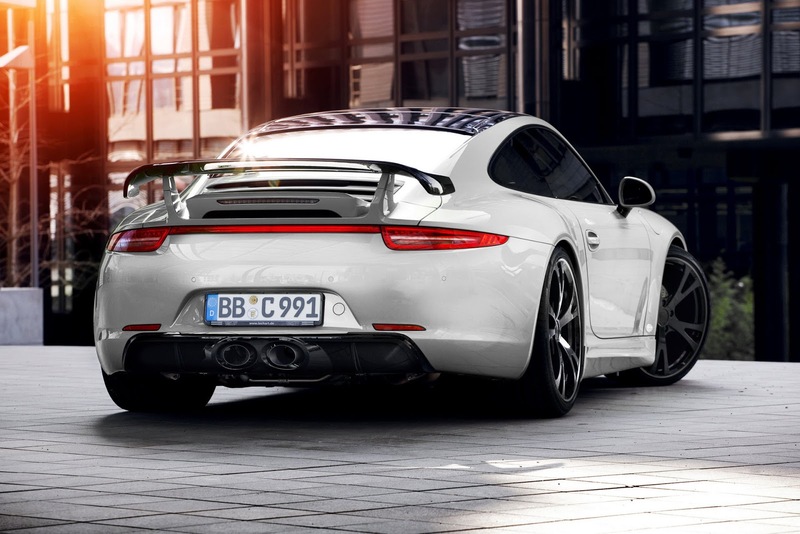 The valve-controlled TECHART Exhaust System Racing with central outflow replaces Porsche’s series-standard 4-pipe exhaust system and gives the vehicle a more aggressive and sporty look, which harks back to the RSR models. Controlled via the sport button on the centre console, it makes the acoustic performance of the Porsche 911 Carrera 4S significantly richer and more robust. The valve-controlled TECHART Exhaust System Racing can be used even when closed under full load across the entire speed range. Also available: the TECHART Sport Muffler Racing and the valve-controlled TECHART Sport Exhaust System combined with dual TECHART Sport Tailpipes. Both systems can be recognized when the car is parked thanks to their black matt or chrome finish TECHART Sport Tailpipes in typical dual oval design. TECHART Sport Tailpipes are also available for the series-standard exhaust system of Porsche 911 Carrera S and 4S, as well as for the Porsche sport exhaust system of all current 911 Carrera models. The innovatory power of the TECHART brand is not just visible from the rear, but also from the vehicle’s front. Here, the optionally available TECHART Noselift System creates 60 mm more ground clearance at front spoiler by raising the vehicle level. The system can be activated both when the car is stationary and in motion. The vehciel automatically lowers itself at speeds of over 60 km/h. The boot space remains unchanged thanks to the compact design of the hydraulic unit. 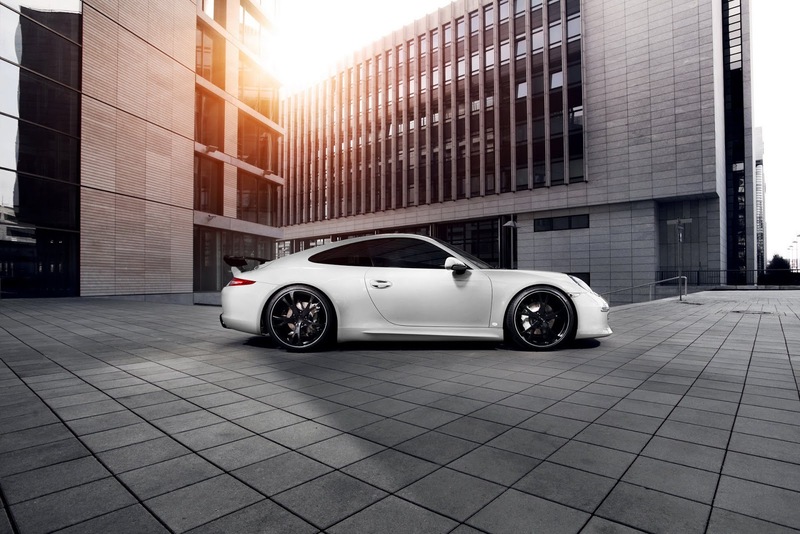 The aerodynamics kit for the Porsche 911 Carrera models has been optimised by TECHART in the wind tunnel in view of the aerodynamic effect on the entire vehicle. The two-part TECHART Front Spoiler I with integrated splitter reduces the lift on the front axis of the Porsche 911 Carrera models by 5 kg at a speed of 140 km/h. The TECHART Rear Spoiler II (three different variants available) produces an additional 17.5 kg of downforce at the same speed when combined with the TECHART Diffuser on the rear of the vehicle. This value increases to 76 kg as the highest speed is reached. Two Aero Wings, which are integrated into the front air inlets, lend the Porsche 911 Carrera models a dynamic shaft outline. TECHART Side Skirts on the vehicle wing, as well as TECHART trims for headlights and side mirrors create additional visual highlights. The TECHART individualization program for the Porsche 911 Carrera 4 models is emphasised by the new TECHART Formula IV light-alloy wheel in 5-twin-spoke design, in dimensions 20- and 21-inch with standard or individual colours as well as in bi-colour finish. The weight reduced TECHART Formula III forged wheel is also available in standard or individual colours, bi-colour finish or ceramic burnished glossy smooth finish. 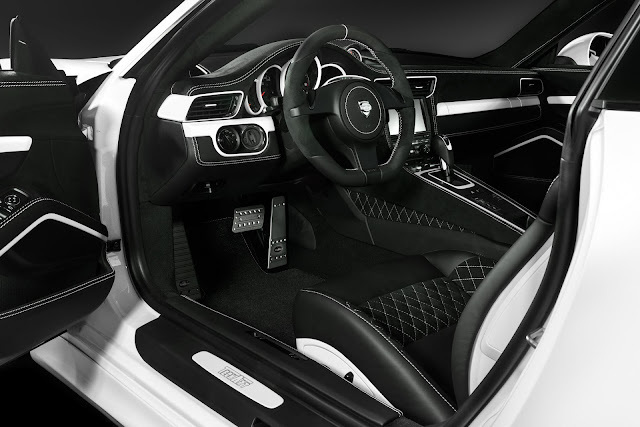 The in-house saddlery uses precise handiwork to incorporate the exterior design of the TECHART individualization program for Porsche 911 Carrera 4 models in the vehicle’s interior. The new illuminated TECHART Aluminium Door Entry Guards can be designed individually and represent an eye-catcher before the driver takes a seat behind the ergonomically shaped TECHART 3-spokes Multifunctional Sport Steering Wheel with TECHART Paddle Shifters. TECHART Aluminium Sport Pedals and TECHART Aluminium Foot Rest provide ideal grip for precise control of throttle and brake. Whether TECHART decorative stitching, backrests for sport seats Plus in leather, safety belts or in-house produced TECHART Interior Styling Packages in coloured carbon fibre. All vehicle details pick up the stylistic theme constantly. Also in terms of the dashboard instruments, refined by TECHART, with easily readable TECHART dials, harmonized rings and Sport Chrono device in leather. 0 Responses to "TECHART FOR THE PORSCHE 911 CARRERA"